Designed and manufactured by Canadian-based Eco-Tec Inc., the BgPur units have begun purifying biogas produced at waste treatment facilities in Lancashire, by removing corrosive levels of hydrogen sulfide (H2S); in turn, recovering the gas for use in power generation. The first BgPur began operation in July 2011 at the Thornton Waste Facility and the second in November 2011 at the Leyland Waste Facility. Both were designed by international engineering and project-management company AMEC, and are run by waste management and recycling organization Global Renewables. While the systems are set up to clean H2S at 99% efficiency per site, they have recorded levels beyond 99% and continue to perform consistently since the start ups. "We're happy with the system's performance. In some instances, it has gone beyond the capabilities specified and was also one of the easiest start ups we've experienced so far," said an AMEC representative. The BgPur systems are playing an essential part in Global Renewables' unique waste-treatment process known as ‘UR-3R' (Urban Resource - Reduce, Recover, Recycle), made up of a combination of some of the world's leading environmental technologies. Through the process, the facilities will treat over 300,000 tonnes per annum of Lancahsire County's household waste while extracting the maximum amount of recyclables from the waste stream and turning the environmentally damaging organic fraction into a high-quality type of compost product called Organic Growth Medium (OGM). As these organic wastes are digested, Eco-Tec's BgPur purifies the biogas produced through patented, high efficiency gas-liquid contactors. The contactors process 1,100 m3/hr sulphur with a concentration of 5,000 ppmv (parts per million volume) of H2S per site, purifying it to consist of less than 50 ppmv of H2S. In turn, the recovered gas is used as fuel to generate electricity for the parasitic demands of the sites. The net result is 100% recycling, reducing the waste to the landfill by 70%, and reducing the carbon dioxide emission by 1.5 tonnes per tonne of solid waste collected. 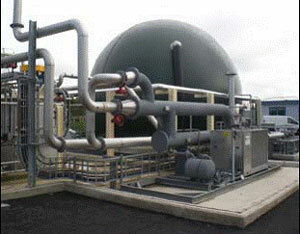 "Eco-Tec is proud to play a part in such an innovative, meaningful waste-treatment process. And we're glad to be able to add real value to the market by providing technology that not only lowers our clients' operating costs but is also solving greenhouse gas issues at the same time," says Carmine Fontana, Eco-Tec vice-president, Gas Processing. Eco-Tec is a globally recognized manufacturer of water purification, gas processing, and chemical recovery systems for industrial operations. Eco-Tec provides proven integrated technologies based on proprietary technologies that offer significant cost reduction, superior process efficiency, and facilitates an environmentally responsible approach to using natural resources. Eco-Tec has provided more than 2,000 systems in over 55 countries, and is represented in all major markets. For more information, visit www.eco-tec.com.